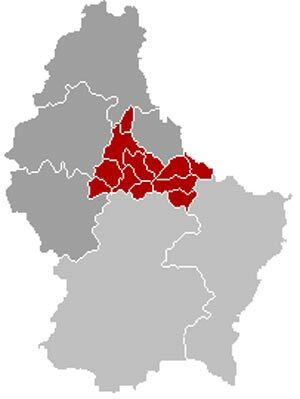 Diekirch is a canton in Luxembourg in the district of Diekirch, consisting of the communes Bettendorf, Bourscheid, Diekirch, Ermsdorf, Erpeldange, Ettelbruck, Feulen, Hoscheid, Medernach, Mertzig, Reisdorf, and Schieren. It covers an area of 214.93 km² and (as of July 1, 2006) has a population of 26,021. Until January 1, 2006 it also included the community of Bastendorf, which had a land area of 24.44 km². This territory was then ceded to the adjoining Canton of Vianden when Bastendorf decided to join the community of Tandel in that canton.